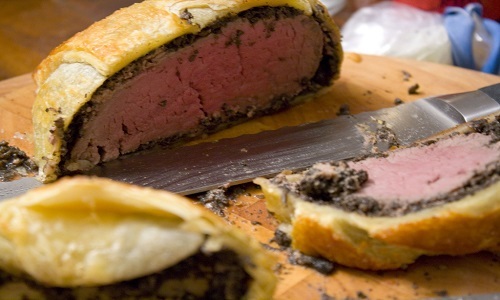 It is a type of a Pasty, made with whole beef fillet (tenderloin), which is traditionally smeared with foi gras (pate) and/or truffles (Duxelles) sometimes enhanced with Madeira and finally baked wrapped in pastry. Spices such as ginger, shallots, all spice, etc. is used for flavor. 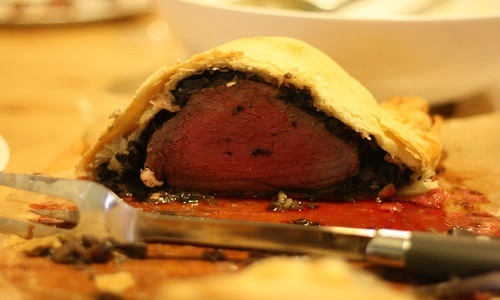 Beef Wellington can either be cooked in a large cut, or it can be sliced into individual portions. Some say that this dish was created in the honor of 1st Duke of Wellington Arthur Wellesley, who defeated Napoleon in the battle of Waterloo in 1815, but there is no evidence to support this theory, because baked pastry with meat has always been a part of English cuisine. Other theory is that this puff meat pastry dish resembled the popular Wellington boots. One more story behind the name is that the famous dish of France that is “Filet de boeuf en croute” was renamed as “Beef Wellington” after the battle of Waterloo, which can be seen in the resemblance as both the dish are very much alike. As per an article by Leah Hyslop in “The Telegraph”, the first reference of the name Wellington was in the year 1903 in “The Los Angeles Times”, a recipe was published for a dish named “fillet of beef a la Wellington” which had little resemblance to the present dish. The first actual occurrence of this dish is in the “Oxford English Dictionary” which sites the Dinaa Ashley’s “Where to dine in 39”referring to “Tenderloin of Beef Wellington”. The definition of this is similar to that of the current Beef Wellington, it says it is a tenderloin of beef, roasted very rare, cooled and roll into pie crust. Later it is sliced in portions and serve with sauce Madera. There is one indirect reference to Beef Wellington at Wellington Hotel in Gloucester in 1926. Sauce named “Wellington Sauce” which is served with beef, other than this all other reference to this dish is modern or not from England and are not related to the Duke. Once a very popular dish lost its value with time due to modern fusion, but lately the dish once again got its due, thanks to Chef Gordan Ramsay whose signature dish is Beef Wellington. If you want to see how he makes this dish, here is the Link. Traditionally this dish was made with tenderloin of beef, foi gras, homemade puff, spices and duxelles (Mixtures of truffles/mushrooms, herbs, scallions, shallots, etc.). Nowadays the touch of tradition is hardly seen in Wellington as duxelles is replaced by canned mushroom, homemade puff is replaced by ready made puffs, foi gras is replace by chicken liver also the steak is omitted and other meat like lamb or chicken is used. Usual accompaniment of Wellington is Madeira, Colbert, Bearnaise, Perigourdine or Chateaubriand. Minced Shallots ———————————————– 4 tbsp. Dry Madeira Wine ——————————————– ½ Cup. Foi Gras ——————————————————— 5 tbsp. Olive Oil ——————————————————- 1/3 Cup. Onion Sliced —————————————————- ½ Cup. Dried Thyme —————————————————- ¼ tsp. Bay Leaf ———————————————————– 1 no. All Spice Berries ———————————————— 3 nos. Dry White Vermouth —————————————– 1 Cup. Cognac or Brandy —————————————— 1/3 Cup. Tenderloin (250 grams each) ——————————– 8 nos. Prosciutto Ham ————————————————- 4 nos. Puff Pastry ————————————————— 2 Sheets. Beef Broth —————————————————– 2 Cups. Tomato Paste ————————————————- 1 tbsp. Madeira Wine ————————————————- ¼ Cup. Mix all the marinate ingredients except for the salt, vermouth and cognac. In a sauce pan cook the mixture on low flame until the vegetables are tenders and the juices starts to come out. Once done remove from heat and let the mixture cool down. Rub the salt on the fillet and pour the wine and the cognac. Mix the steak with the cooked mixture so that the meat is coated properly. Refrigerate the steak for 3 hours after putting the steak n zip lock bag. Remove the fillet from the marinade and pat dry. Keep the marinade for the sauce. Take 1 tbsp. oil in a pan and heat it over high flame. Sear the fillet in the oil properly by turning to the all sides. Mince the mushroom and remove the juices from it by twist drying it in a wet kitchen towel. Keep the juices aside for the sauce. Sauté the mushroom and the shallots in a pan for 10 minutes so the mixture is cooked dry. Add the Madeira and cook until the liquid is evaporated, add salt, pepper and foi gras and keep the mixture aside after cooking for 2 more minutes. To make the sauce simmer the broth with marinade and the mushroom juices add the tomato paste and reduce the mixture to half, add the seasonings, corn flour, Madeira and keep the sauce aside. Roll out the sheet of pastry over a cling film and lay 2 slices of ham over one sheet of pastry. Place two spoonful of duxelles on top of the ham and then place 4 pieces of steak again top it with duxelles. Wrap it up carefully by twisting the sides with the help of the cling film. 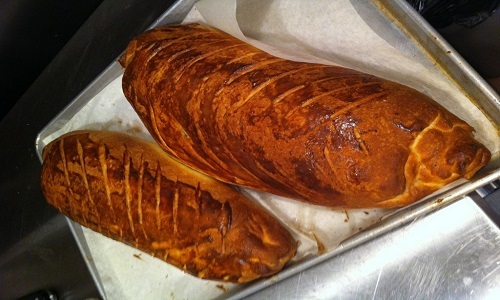 Place the wellington in the refrigerator for 10 minutes, this will make it firm before cooking. Apply egg yolk over it with a brush and give slight slits on the pastry from back of the knife, this will give wow factor to the wellington. Sprinkle little salt on the pastry and bake it at 200 degree F for 30 minutes. Remove from the oven and let it relax for 10 minutes so that the juices are absorbed in the steak.